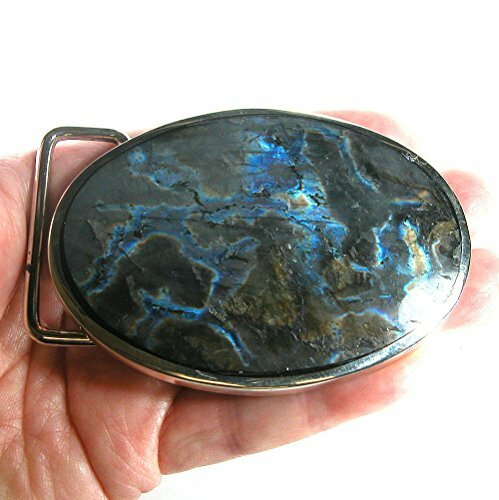 A lovely labradorite focal set in nickel-plated brass belt buckle! I custom cut the cabochon with material from Madagascar. Measurements are in the title in millimeters. Feel free to check out all the items in my DVHdesigns Handmade Storefront and once there you can contact me with general inquiries or about a custom order. Thanks for shopping DVHdesigns! NOTE: Some people call this "spectrolite", which is incorrect. Spectrolite is a trade name for high quality labradorite from Finland and only Finnish labradorite may accurately be called spectrolite! Nearly ALL the commercial labradorite one sees is from Madagascar. Very, very little comes from from Labrador or Finland! I have worked with all three and buy the rarer material directly from people from those countries. If you have any questions about this product by DVHdesigns, contact us by completing and submitting the form below. If you are looking for a specif part number, please include it with your message.